I've put together some essential products all of which I use myself, to support, educate and help you promote Dorn. You can order directly from this website below, and make your payment securely using Paypal (who also take credit and debit cards). 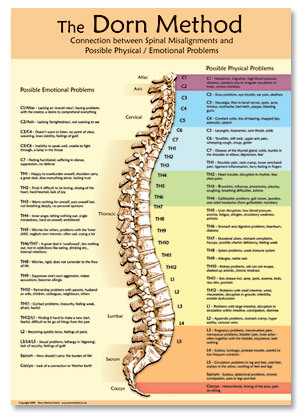 This is a large, clear and colourful A2 sized poster showing the spine with all the vertebrae clearly labelled along with short descriptions for each. The poster lists each vertebrae together with possible physical and emotional problems according to current theory. It's a wonderful poster which looks fantastic in any Dorn Therapists clinic helping to educate and inform. Whilst working with my clients, they often face this poster which prompts many to start asking me questions about Dorn and how it works; again, it's a marvellous way to inform and educate people about The Dorn Method. Dorn Method Information Handout Leaflets - Revised and Updated! 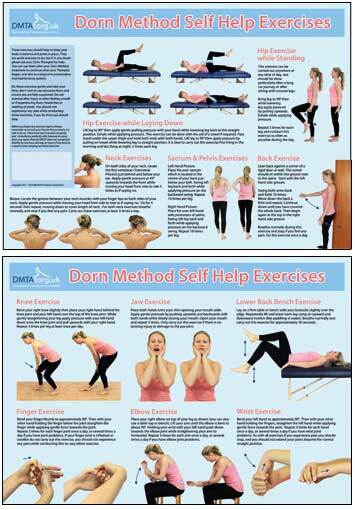 I use these leaflets to provide my Clients with an introduction to The Dorn Method, they also help to create awareness. They're great because people love to read up on the therapy they're receiving and also like something to take away with them. They're printed in full colour on quality paper, A4 sized and folded twice so they're easy to pop into a hand-bag or pocket. Each leaflet has space for you to add your own name and contact details, either using a sticker or simply hand written. 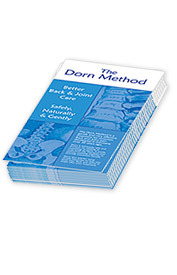 The leaflet explains what the Dorn Method is, touches on a bit of theory and also explains briefly what the client can expect during a Dorn Method therapy session. The leaflet also answers some common questions people have about Dorn. The Dorn Method teaches a series of self-help exercises which are designed to help people look after themselves over the long term, and to carry on where the Therapist left off. These great looking A4 sized leaflets have been designed as a hand-out to clients after their therapy. Printed in full colour on both sides, the leaflet outlines 12 of the most common self-help exercises which should be carried out on a daily basis. Each colour photograph includes instruction on carrying out the exercise. Also included is a space for a Dorn Therapist to include their own details, such as an address sticker or stamp. 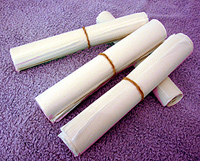 Silk Paper is used in the Breuss Massage, helping to soak up the St. John's Wort oil after each massage. This is the same high quality paper that I use when giving Breuss Massages, chlorine free, size per sheet is 25cm x 75cm. Each roll comes with 25 sheets which works out at only 20p per sheet.